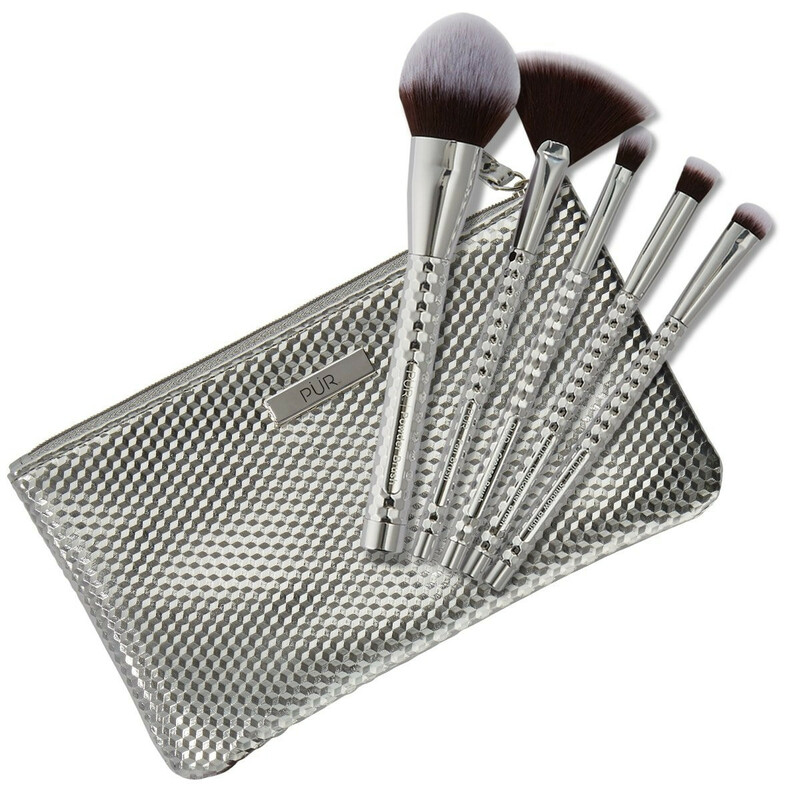 What it is: A luxe 5-piece cruelty-free brush set. What this set contains: 1 x Powder Brush, 1 x Concealer Brush, 1 x Crease Brush, 1 x Shadow Brush, and 1 x Fan Brush, plus a silver travel bag for easy storage. Super soft brushes. Good variety of brushes in the set, and the pouch is a great bonus. I would recommend this set. I purchased this as a gift for my niece. She loved them. Sturdy brushes with pliable fiber that is super soft and compacted to make a perfect combination . I am very happy with this purchase. bought these as a gift for my sister in law who is a pro when it comes to make up and she loved them ! Ordered the Essentials Brush Set. I have other name-brand brushes, and this Essentials Brush set is what I tend to reach for now! LOVE the bag and silver design of the brushes. The large powder brush is soft (all of them are actually). The fluffy, flat-headed concealer brush is perfect for air-brushing under eyes. These look good and the bristles are soft. A good deal for the price, perhaps, but they are quite large. Someone else may like that, but I don't like my brushes to take up so much space. These brushes are soft and great give you an amazing finish my makeup has been looking super smooth after using these brushes . They don’t shed !! So no little brush hairs stuck in my foundation anymore !! These brushes are soft, sturdy, and sleek! The powder brush bristles are so comfortable and do not irritate my skin or give me that uncomfortable “pokey” feel. The eye brushes are fantastic I feel like I don’t need anything additional for my eye looks, the cute bag is a plus!! Thank you for not using animal hair for your brushes, Pur! I love the sleek design and the handles are so well made. You can tell the quality of these brushes, that they will not fall apart or shed(biggest pet peeve). Super soft bristles. I've already washed mine and there was zero shedding. Very happy with how these blended product. Cute bag too. in love with the brush set, huge believer in synthetic brushes, so smooth on the skin and eyes my applications are so beautiful after i use these brushes ! super easy to clean, the handles are amazing.